Continuous improvement is a general rule of thumb for the British Army – the ever changing nature of warfare necessitates it – and is occurring across the pan-Army officer education continuum from the Commissioning Course, at the Royal Military Academy Sandhurst (RMAS), to the Higher Command and Staff Course. In each case, the training progression is being tailored for both Regular Army and Reserve Officers (driven by Army2020), integrating the two where practical. There has been an increased emphasis on ‘self-paced’ learning and a balance between residential and distance learning courses, aiding cost efficiencies. Research and investment has also been made in appropriate learning technologies and partnerships formed with training simulation and development companies (Defence Committee, 2013). The Review of Officer Career Courses (ROCC) and ROCC2 has delivered improvements in how the Army will ‘sharpen the agile edge’ through the new Captains Warfare Course, revision of the Intermediate Command and Staff Course (Land) and to the joint Advanced Command and Staff Course. Junior Officer Command & Staff Training (CST) remains essentially single-Service, but with an eye on the common entry standards needed for more advanced courses. Junior Army officers undertake the Junior Officer Leadership Programme (JOLP) and the Junior Officer Tactical Awareness Course (JOTAC); which together form the Junior Officers Leadership and Management Programme (JOLMP). JOLP starts during the Commissioning Course at the Royal Military Academy Sandhurst (RMAS), continues through Regimental Duty and culminates in a week-long distributed learning course. JOTAC is a 4-week residential course at the Land Warfare Centre in Warminster, and a pre-requisite for promotion to Captain. Overlaid on these are three modules of Military Analysis and two Military Knowledge courses, which are distance learning packages completed in parallel during the course of normal duties; successful completion is a prerequisite for promotion to Major and attendance at the Intermediate Command and Staff Course (Land) (ICSC(A)). The MK syllabus is normally reviewed, and if necessary, updated twice a year in May and November. However, there may be updates at other times which are normally communicated via the MK website. Keep this in mind when starting, as students are required to restart any course that has not been completed due to the introduction of major updates. The following: JOLP2 Record of Training will provide the reader with an idea of the work to be undertaken during the Junior OCD Programme. The Junior Officer Tactical Awareness Course (JOTAC) is mandatory for all British Army and Royal Marines officers and is delivered by the Land Warfare Centre, Warminster. The aim of JOTAC is to prepare Officers for the rank of Captain by raising their awareness of combined arms tactics and by developing their combat staff skills. The purpose of JOTAC is to produce an Officer who has the requisite combat knowledge required of a sub-unit 2IC (Squadron/Company-level), a watch keeper, a liaison officer and with further training, a specialist troop commander or combat staff officer. JOTAC is a 4-week course (Army Reserve join halfway through) consisting of tactical exercises without troops (TEWTs) and classroom exercises assisted by computer simulation. The focus is on the sub-unit, but there is exposure to battle group and brigade levels. The training objectives include mission planning, force preparation, deployment and recovery, simulated ground manoeuvre, protection and the management of combat service support. According to research endorsed by the Chartered Management Institute, if an employer were to pay for training to deliver equivalent employee development it would cost them in the order of £8,275 (SaBRE, 2012). This only relates to the skills that would be relevant to a civilian workplace – areas such as leadership and management skills. The cost of JOTAC training for international defence training students is estimated to be approximately £14,000 per student. The Military Knowledge (MK) range of courses is one of the results of a detailed study, the Review of Officer Career Courses (ROCC), which was commissioned to identify the education and training that officers require at various stages of their careers. Further explanation of these stages is contained in the Officer Career Development Handbook (OCDH) 2014DIN07-072. MK is not like many formal military instructional manuals or other documents. It is not written in a military manner, using Defence Writing conventions and it is designed specifically for on-line study, which requires a very different style to promote effective understanding and learning and, possibly, even enjoyment! With this in mind, the MK courses have been developed for the British Army by the Military Knowledge Office (MKO) at the Defence Academy of the United (DAUK) College of Management and Technology (CMT), in conjunction with Cranfield University. The courses are managed by MKO for the Land Forces Training Division, the Training Requirements Authority (TRA). The Subject Matter Authority for the content of the MK courses is the Director Army Division, Joint Services Command and Staff College (JSCSC) and the Director’s staff, with nominated Army Proponents keeping the material under review in light of changes in Defence and identifying areas that need updating. The MKO includes military authors and project managers, who are responsible for delivering updated courseware through the Cranfield University design and programming team. 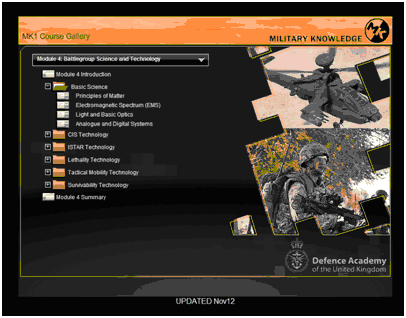 The MK courses are hosted on the Defence Learning Portal (the British Army’s Virtual Learning Environment (VLE)). The JOTAC and the Captains Warfare Course (CWC) have in-tests based on lessons in their linked MK courses. Before students attend each residential course they are told what preparation is required for the respective in-test. As directed within chapter 14 of the Officer Career Development Handbook (OCDH), the Military Knowledge (JOTAC) – Military Knowledge 1 (MK1) prior to November 2014 – course is mandated for junior Captains of the Regular Army and Royal Marines (RM) (RM students will still complete the MK1 & 2 course variations). However, it is also suitable for those in the Defence and Security sectors as useful reference material for Battlegroup capability. The aim of the course is to deliver the additional underpinning knowledge required by junior Captains of the Regular Army and RM for junior command positions, and it also provides the necessary grounding for JOTAC, CWC and Biege. MK (JOTAC) focuses at the battlegroup level to deliver the military, management and technical knowledge required by junior officers. MK (JOTAC) is based on approximately 45-50 hours’ web-based distance learning, consisting of six modules, with each module having a series of formative and summative assessments at the end. Module 1: The British Army. Module 2: The British Approach to Operations. Module 4: Battlegroup Science and Technology. Module 5: Battlegroup Command and Training Tools. Module 6: Battlegroup Operations (AFM Vol 1, Part 2, Battlegroup Tactics, Issue 3.0, Jan 07). MK JOTAC is to be completed prior to attendance on the Captain Warfare Course (see below). As directed within chapter 17 of the OCDH, the Military Knowledge CWC and Biege – MK2 prior to November 2014 – courses are mandated for senior Captains of the Regular Army and RM (RM students will still complete the MK1 & 2 course variations). However, it is also suitable for those in the Defence and Security sectors as useful reference material for formation capability.The aim of the course is to deliver the additional underpinning knowledge required by senior Captains of the Regular Army and RM prior to taking an SO3 (Staff Officer 3) appointment and also prepares them for the Captains Warfare Course. Module 1: Formation Capability Part 1. Module 2: Formation Capability Part 2. Module 3: Formation Capability Part 3. Module 4: Brigade Tactical Actions (Formation Operations) (AFM Vol 1, Part 1, Brigade Tactics). Module 5: Operational Planning (AFM Vol 1 Part 8, Command & Staff Procedures, Chapter 6, Section 2, Issue 3.0, Nov 07). MK Biege is to be completed prior to selection for promotion to Major. Military Analysis (MA) are 1-week, classroom-based courses run at Army Education Centres (British Army, 2014a) around the world, in which students write an essay. There are three different modules of which the subjects/titles change every few years (Doomsayer, 2005) and is a requirement for promotion. The Department of Defence and International Affairs (DIA), located in Faraday Hall at RMAS, also teaches the MA course to Captains as part of their preparation for promotion to Major (British Army, 2014b). Students are encouraged to re-read their essays before the ICSC(L) GEOD module starts (see Section 3.2.1). The Captains Warfare Course (CWC) is an 8-week residential course delivered by the Land Warfare Centre, Warminster. CWC is a pre-requisite for promotion to the rank of Major. The MK2 distance learning package and assessment must be completed prior to attendance on CWC and students should be BCIP 5.5 staff users qualified (the software used at Battle Group level to assist with the planning of the Combat Estimate). All students will complete an In-Test on Day 1 of the course, which is designed to confirm students’ levels of preparedness for the course. Part of it includes a number of questions that will test recall of knowledge covered in the MK2 package completed prior to the course. Additionally, students will be assessed on their ability to navigate relevant doctrine publications in order to find information. The 7 Questions, as covered in MK 1 and the DLW-sponsored Combat Estimate eLearning Module. Questions relating to doctrine publications will require students to provide specific page references stating where information can be found. These questions will be selected by LWS from a question bank. Access to relevant doctrine publications will be provided, and that element of the assessment will be ‘open-book’. The pass mark for the in-test will be 60% for both parts. Any student who fails to meet the required standard will be subject to review under the authority of Commandant LWS. LWS reserves the right to RTU students who demonstrate inadequate preparation for the course. Performance on the in-test will be taken as evidence for comments on students’ preparedness for the course, and a clear statement reflecting preparation for the course will be included in end of course reports. Course reports will be sent directly to students’ Commanding Officers. Students are strongly advised to prepare well for the In-Test. One of the first tasks on CWC is to produce five minute presentations concentrating on the role of your unit within the Army 2020 structure, which is followed by a number of exercises concentrating on staff work, similar to the Late Entry Officer’s Course. The latter half of week one will see presentations by ETS on thought processes and thinking skills which will lead to the production of presentations to be delivered in week seven. Week two will see the ‘real’ work begin, with the focus shifting towards the Combat Estimate (CE) and the planning process to deliver successful operations. Initially this will be at Battle Group level focusing on Force Generation and the movement order to deploy on operations. The CWC scenario is well thought out and very detailed, with each exercise having been meticulously planned and all events are cumulative (i.e. they follow on from each other). The initial exercise is a deployment with ATROPIAN Forces as a show of strength to their neighbours ARIANIA who are massing on the border. After deployment, the exercise turns into a number of war fighting activities ranging from defence to delay, culminating in a brigade stabilisation operation in Bath. Each activity is planned by the syndicate using the full CE process, with the planning processes taking approximately four days. Prior to the delivery of the OPO from higher formation, appointments are issued and these range from Commanding Officer (CO) to Intelligence Officer (IO). The process begins with the Receipt of Orders Brief (ROOB) that is delivered after the Operational Staff Work (OSW) for the exercise has been received. The ROOB highlights any issues that the CO and their Principal Planning group could use to begin the Mission Analysis whilst the IO and the Battle Group Engineer (BGE) formulate their Question 1 back brief. Once the full CE process is completed, it will culminate in the delivery of orders to another syndicate. This process will usually last two days and once orders are delivered, then the plan can be executed on the Battle Command and Control Trainer (BC2T: a computer based system that allows a battle plan to run against a live enemy) having first been practised in a Rehearsal of Concept (ROC) drill. The execution is conducted by the syndicate who received the orders and is controlled by a make shift Operations Room that is run by the syndicate in appointment. Each lunch time syndicates will change over. The whole process is completed by a Training Exercise Without Troops (TEWT) that covers the area used in the planning phase and brings an end to the serial. In total, there are five Combat Planning Exercises (CPE) to conduct and the summative test for the CE is the production of an Individual Planning Estimate that focuses on a Non Combatant Evacuation Operation that lasts six hours. As a break from planning participants will treated to a brief on project management and a few days of Contemporary Staff Writing (CSW) which focuses on the procurement process and touches on project management. Newman & Spurr Consultancy Ltd (commonly referred to as NSC) is a training simulation company based in Camberley, Surrey. NSC provides a range of Defence related training and the company’s computer-based training expertise is being used to hone the skills of students on the CWC (NSC, 2014a). In 2013, NSC and Atkins (a UK design, engineering and project management consultancy) were contracted by the MOD to help develop and support a range of innovative computer-based instruction methods for the British Army’s Captains’ Warfare Course (Potter, 2013). Fulfilling a similar role to JOCASTS (Joint Operations Command and Staff Training System) but at the operational level, CONTACT is a real-time constructive simulation system that confronts commanders with the complexities of conflict (NSC, 2014b). It is currently among the teaching tools deployed on the CWC to exploit lessons learnt from previous operations and prepare personnel for future missions. Already used to support the training of command and staff officers prior to deployment, the simulation allows individuals or small groups of users to trial courses of action (COA) in a fully-customisable environment. CONTACT’s simulated exercises and assessments provide instructors with the ability to pause, rewind and fast-forward the action to deliver instant feedback or encourage syndicate discussion. A new Smartphone app (Frost and Black, 2013) has also been developed to help Officers with the lengthy combat estimate process and underwent trials in 2013. The Seven Questions aide memoire, produced by the Directorate of Training (Army), is being used on the Captains Warfare Course and enables students to familiarise themselves with the topic before lessons and then consolidate their knowledge after. The app is also complemented by an e-learning package, available on the Army app store. The Battlespace Technology MSc (BTMSC) provides selected Majors, on promotion and ahead of the ICSC(L), with the technical knowledge and skills required for demanding assignments in the Technical Career Field (CF) up to and including Lieutenant Colonel. The BTMSC course provides a broad understanding of fundamental technologies, their acquisition and support, and a deeper understanding of a particular sub-set of battlespace technologies and capability integration, to enable graduates to contribute more effectively to the delivery of defence capability. Students initially study a broad based Introduction to Battlespace Technologies module, encompassing Lethality, Survivability, Mobility, Command and Battlespace Management and ISTAR. Students then elect to follow a technical stream in a particular area of battlespace technology, either ‘Battlespace Manoeuvre’ or ‘Information Superiority’. Students will gain an in-depth knowledge of the relevant technology, together with a sound understanding enabling them to analyse available solutions. Students going to a modelling and simulation post will study a modelling and simulation half stream within the BM stream. This is followed by a Defence Acquisition and Project Management module, which provides the knowledge, skills and techniques critical to the delivery of capability through all stages of the Defence Acquisition cycle. All students also undertake a module to develop an understanding of how to enhance capability through networking, including actual and potential benefits and the risks and challenges. Finally, at the end of the taught phase of the course, all students pool their knowledge in a realistic acquisition exercise exposing issues of requirements analysis, design trade-offs, capability integration and team working. To complete the MSc, students need to plan and undertake a defence related research project in a technical subject or having a technical implication. Through this project, they will be expected to demonstrate Masters level competency in research, synthesis, analysis and critical evaluation of information associated with the acquisition or provision of defence capability. Postgraduate Diploma (PGDip): A part time, residential taught course normally over 30 weeks. Students are drawn from the ICSC(L) ‘b’ course and attend the BTMSC before starting ICSC(L) in January. Students return to BTMSC to complete the Capability Integration module in February. On completion of this final module in April, students return to ICSC(L) from April to August. MSc: Having successfully completed the PGDip, those students wishing to complete the MSc are expected to complete the project before the end of their two year BTC related employment posting. The Intermediate Command and Staff Course (Land) (ICSC(L)) aims to prepare British Army And Royal Marines Majors, at the start of Career Stage 2, for appointments in sub-unit command (Squadron/Company-level) and on the staff to and including Lieutenant Colonel. ICSC(L) is a residential, comprehensive and generalist mandatory career course delivered by the Army Division of the JSCSC and is delivered through a series of modules, consisting of central lectures, significant time spent in syndicate rooms (classes of 12 students) with additional time dedicated to reflection and reading. The course runs twice per year: the A Course from September to April and the B Course from January to August. Formation Level Planning (Term 2). The aim of the Staff and Communications Skills (SCS) module is to introduce and apply a range of analytical, decision making and communication skills required for the (ICSC(L) and in future employment. The module runs twice a year – once as part of the ICSC(L)A course (Sept-Apr) and once as part of the ICSC(L)B course (Jan-Aug). The A course module typically runs for 5 days during the second and third weeks of September. The B course module typically runs for 5 days during the second and third weeks of January. There is currently no stand-alone summative assessment for the SCS module and students should have completed the SCS section of the Military Knowledge ICSC(L) distance learning course, which is an entry requirement. CLM Part 2 – personnel management focus within Army context. The module runs twice a year – once as part of the ICSC(L)A course (Sep-Apr) and once as part of the ICSC(L)B course (Jan-Aug): The A course module typically runs for 5 days during the middle of September (Part 1), 4 days in early Dec (Part 2) and 1 day in late April/early May. The B course module typically runs for 5 days during the middle of January (Part 1), 4 days in late March/ early April (Part 2) and 1 day in late July/ early August. There are five elements within the module as a whole, each delivered during one or more parts: Leadership theory; Experience; Ethics; Culture; Personnel management. The three parts of the module are not examined separately. Students completing the whole of the ICSC(L) course will be examined on the Training Objective (TO2); ‘to evaluate leadership and command in the delivery of military capability’. The exam is currently a formal, individual, research and analysis based oral presentation (20 min) followed by viva (10 min). The aim of the Global Effects on Defence (GEOD0 module is to enable students to evaluate the nature of warfare, the current and emerging strategic environment, and how the military contributes to achieving the UK’s strategic goals. The module runs twice a year – once as part of the ICSC(L)A course (Sep-Apr) and once as part of the ICSC(L)B course (Jan-Aug). The A course module typically runs for just under 3 weeks from the end of Sep to the middle of October. The B course module typically runs just under 3 weeks from the end of January to the middle of February. Element 4: Ex REGIONAL OWL. A case study looking at a specific part of the world. The GEOD module is currently examined through completion of a 2500-word essay, completed in students’ own time, over a number of weeks. Students are also encouraged to re-read their Military Analysis essays before GEOD starts. The aim of the Management of Defence module is to enable students to understand why and how Defence capability is generated through the application of the principles and processes associated with the higher level management of Defence and the Army. The module runs twice a year – once as part of the ICSC(L)A course (Sep-Apr) and once as part of the ICSC(L)B course (Jan-Aug). The A course module typically runs for 2.5 weeks in October. The B course module typically runs for 2.5 weeks in February. Element 1: Higher level management of Defence. This will cover the basic structure of the MoD; the strategic level management of Defence; the fiscal context within which Defence operates; the path from the nation’s security strategy, through Defence departmental policy, to explicit direction and structure; strategy planning and management; resourcing and equipping Defence and the Army and how the MoD approaches risk and risk management. Element 2: Defence capability. This will cover capability development, delivery and generation and the Defence Lines of Development (DLoDs). Element 3: Management of the Army. This will explain how the Army HQ is organised, what its key functions are and the challenges and issues it is currently addressing. It includes a one day visit to Army. Students who are to complete the Management of Defence exam will need to ensure that they are confident with the use of the required JSP 101 templates. This module is currently examined through completion of a written exam which takes place for the duration of half a day at the end of the module. The aim of the Equipment module is to enable students to analyse how technology and equipment support Land environment operations. The module runs twice a year – once as part of the ICSC(L)A course (Sep-Apr) and once as part of the ICSC(L)B course (Jan-Aug). The A course module typically runs for 4 weeks in November. The B course module typically runs for 4 weeks in March. Understanding the technology: covering the key aspects of the main technologies that underpin our equipment and hence enable our capabilities. Understanding capability: appreciating that, without the through-life integration of the Defence Lines of Development, individual technologies, equipment’s and systems cannot deliver capability. Understand the concept of Trade-off: the perfect piece of equipment does not exist as the laws of physics preclude this. It is always necessary to compromise one aspect of an equipment’s (or capability’s) performance in order to maximise another aspect deemed more important. This conscious, informed act of compromise is known as a ‘trade-off’. Understanding Risk: accepting a trade-off always introduces risk. The key to making a successful trade-off lies in understanding the resultant risk and, wherever possible, putting mitigating plans in place to minimise the likely impact. 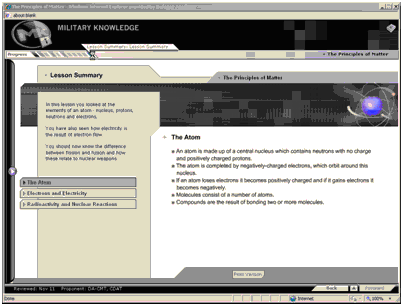 The elements of the module are delivered in a logical sequence which starts with Threats and then progresses through the technological domains of: Lethality; Survivability; Mobility; Supporting Technologies and Future Technologies, introducing the relevant technology fundamentals where necessary in order to fully develop students’ understanding, before moving on to examine Business Skills, Acquisition and Capability Integration. The Equipment module is currently examined through completion of a written exam which takes place for the duration of half a day at the end of the module. The aim of the Military Assistance to Stabilisation and Development (MASD), Counter-insurgency (COIN) and UK Operations (MASDUK) module is to analyse the nature of Stabilisation and Peace Support operations in the 21st Century, together with the role of the military in resilience operations in the United Kingdom (UK Operations). The module runs twice a year – once as part of the ICSC(L)A course (Sep-Apr) and once as part of the ICSC(L)B course (Jan-Aug). There is currently no stand-alone assessment for the MASDUK module. However, the 3-day UK Operations element is an accredited course which is alternative to the Emergency Planning College’s Resilience Level 2 course. The course is held at the JSCSC with the potential opportunity to participate in a follow-up exercise for two weeks in the USA. AFM Volume 1, Part 1, Ch 5: Formation Tactics. There are six formal assessments throughout the ICSC(L) course. Currently successful completion of the courses attracts CMI and ILM accreditation on payment of the required fee. A number of academic institutions accredit the course with 120 points towards a Masters degree. Further course development should increase the range of institutions. Successful completion of the course plus an additional essay of 4,000 words attracts 20 postgraduate level credits towards the King’s College London’s part-time postgraduate programme, War in the Modern World, which is delivered entirely online by the Department of War Studies to students anywhere in the world. Selected articles from journals etc. The aim of the 46-week Advanced Command and Staff Course (ACSC) is to prepare selected officers for high-grade joint and single-Service appointments by developing their command, analytical and communications skills and by providing a broad understanding and knowledge of joint, single-Service and combined operations, and of defence as a whole. The full Course comprises an academic year of residential education focused at the post-graduate level. The course is accredited by King’s College London, and for those who wish to pursue it, there is the option to complete an MA in Defence Studies concurrently with the Course. Today the ACSC is a joint course; however, the alignment of the differing requirements of the three services was not without its challenges. Historically, selected RN and RAF officers had typically attended advanced staff training in their late 30s, as senior Lieutenant Commanders or Squadron Leaders (OF-3). This was regarded as an opportunity to broaden general military knowledge, specifically of sea- and air-power, and to prepare students for future command appointments. In contrast, Army students were generally either junior Majors (OF-3), or Captains (OF-2) already selected for promotion. The long term aim remained to identify potential senior commanders, but the immediate emphasis was on selection for key operational and staff appointments, and the course content had commensurately academic and tactical flavours. The three staff college courses did congregate for specific lectures, presentations and exercises, but the vast majority of the course content was single-Service. Although the ACSC is now a tri-Service course it still retains some single-Service elements. RN and RAF officers attend the course at senior OF-3 or junior OF-4 levels, and Army and RM officers at junior OF-4 (and some senior OF-3). Some officers have the opportunity to attend Staff College overseas rather than at JSCSC, and the ACSC retains a substantial element of foreign students. The ACSC course is delivered through a series of lectures from senior military and civil servants, academics, diplomats and practitioners who are highly regarded within their field. Central lectures are explored in more depth through Syndicate Room Discussions facilitated by academic and military staff. Academic study is complemented by workshops, practical exercises and visits to single-Service locations and overseas. The ACSC is divided into two Phases covering the three areas of the Defence Functional Framework: ENDS (strategy and higher level policy formulation), WAYS campaigning and the conduct of operations), and MEANS the balancing of policy, capability and resource). The factors which shape the international system and how these affect the UK security context (ENDS). The use of military capability for engagement and across the full spectrum of conflict in single Service, joint, combined and multi-agency environments (WAYS). The principles that govern the Higher Management of Defence in balancing policy, capability and resource (MEANS). The characteristics of Command, Leadership and Management in all relevant contexts and environments. Phase 2: an 8-week Module Phase which allows students to select from a choice of three Modules covering ENDs, WAYS and MEANs to study in greater depth. Evaluate the contemporary CLM context, so its current importance and relevance is understood. Analyse the current academic ideas behind each of the CLM strands, and reflect on their application at the SO1 level and beyond. Understand and apply self-awareness techniques in order to improve personal performance, with a particular insight into how best to deal with failure. Evaluate the personal perspectives provided from those who have excelled in other civilian environments, and reflect upon how this guidance can enhance students’ own personal performance. Analyse the central role of ethics in good leadership. The course is delivered through a combination of pre-reading, lectures, Syndicate Room Discussions and reflection. Deliberately there is no individual formal assessment of the module. Instead, participants are encouraged to reflect on the material presented, and consider how best they can implement it in subsequent appointments. Combat power demonstrations (for Maritime, Land and Air), each lasting 1-2 days. There are also keynote addresses on the part of each Capability Commander. The course is delivered through a series of lectures from senior military and civil servants, academics, diplomats and practitioners who are highly regarded within their field. Central lectures are explored in more depth through Syndicate Room Discussions facilitated by academic and military staff. Academic study is complemented by visits to frontline units in the UK. Conflict and the International System (C&IS) runs over six non-consecutive weeks (September-December). It introduces the students to the theoretical study of international relations and strategy, examines how societies govern themselves and the nature of international law, before examining the UK security context. Examines the concepts and theories that facilitate understanding of the international system and the behaviour of actors within it. Analyses the strategic context and how it shapes the international system. Examines the way societies govern themselves and the evolving roles of international institutions and their continued relevance as actors in the international system. Examines the principles of collective security and the utility of alliances. Regional Security Exercise (1 week): A visit to a European country complements the International Governance course. Strategy in Theory (4 days): Analyses the evolution of strategy, its definitions and distinction from policy and its relevance to the application of military power. International Law and Ethics (4 days): Analyses the nature of international law and its impact on military operations. Foreign Policy, Defence and Decision-Making (2 weeks): Analyses the impact of the strategic security context, and national interests and objectives on the formulation of foreign, security and defence policy. The course is delivered through a series of lectures by senior military and civil servants, academics and practitioners who are highly regarded within their field. Central lectures are explored in more depth through Syndicate Room Discussions facilitated by academic and military staff. South East Asia (3 days). How this impacts on UK interests. The course is delivered through a series of lectures by academics, diplomats and practitioners who are highly regarded within their field. Central lectures are explored in more depth through Syndicate Room Discussions facilitated by academic and military staff. Examines the strategic and economic contexts and how Defence operates at the highest levels to develop policy and strategy. Explores how Defence is scrutinised by external authorities and in what way Defence is held accountable by outside agencies. Analyses the conceptual and actual choices and trade-offs when balancing policy, resource and capability. Analyses the issues regarding capability delivery, through life, and evaluates the relationships in acquisition and support between defence industries and the MOD. Practical Exercise: Policy to Capability (Ex P2C): Starts with decisions on spending plans and continues to the formulation of policy, leading to the identification and delivery of capability. The course is delivered through a series of lectures from academia and senior managers from across Government, MOD, business and industry. Central lectures are explored in more depth through Syndicate Room Discussions and workshop activity facilitated by military staff. Industry delegates are fully integrated into the syndicates and the course includes a day visit to a Defence Industry which allows industry delegates to host a visit to their own company. Students should view the course as an opportunity to engage in peer learning. Examines Joint Action’s deliberate use and orchestration of military capabilities and activities to affect an actor’s will. Examines the range of information activities with an emphasis upon the media. Focuses upon the nature of radicalism and terrorism and the UK policy response, against the backdrop of potential Military Aid to the Civil Authorities. Examines the role of the law and of human rights. Reviews the UK’s Building Stability Overseas Strategy from conflict prevention to conflict termination. Examines the military contribution to building stability. Examines the conduct of Major Combat Operations with an emphasis upon building coalitions. Examines nuclear deterrence and the UK’s nuclear deterrent. The course is delivered through a series of lectures from academia and senior managers from across Government, MOD, business and industry. Central lectures are explored in more depth through Syndicate Room Discussions and workshop activity facilitated by military staff. Industry delegates are fully integrated into the syndicates and the course includes a day visit to a Defence Industry which allows industry delegates to host a visit to their own company. Execution of the theory learnt during this Stage is then consolidated with practical exercises. Strategic Planning: Introduces the student to the factors and constraints involved in decision making and planning at the UK strategic level and how these impact at the military operational level. Operational Art exposes students to the challenges of the operational level and enhances their understanding of the operational commander’s role and responsibilities. Operational Planning develops student operational planning skills. Directing Staff lead the students through an operational planning tutorial based around a war fighting scenario. Campaigning is followed by the Combined Joint European Exercise, which provides the opportunity for students to practice Operational Campaign Planning in an EU context using NATO procedures. The course is delivered through a series of lectures from academia, senior military staffs and specialist Directing Staff. Central lectures are explored in more depth through Syndicate Room Discussions and workshop activity facilitated by military staff. Execution of the theory learnt during this course is consolidated with practical exercises. Week 1: The focus is on the analysis of the exercise scenario and preparing for a Mission Analysis Brief (MAB). Week 2: The students begin to develop specific Courses of Action (COAs) as well as focusing on the humanitarian and International Aid Agency interaction as part of a multi-agency operation. A series of International Aid Agency Workshops are run during which the relationship between the military and aid agencies is explored. These are led and facilitated by non-military individuals with significant experience in their respective fields. In order to facilitate a common approach between the colleges, the NATO Operational Planning Process (NATO OPP) format for operational design is used throughout CJEX. Strategy/Policy (3 weeks): Students will develop a practical understanding of policy and strategy formulation. This will include a 2-day visit to Whitehall, London. Regional Electives (4 weeks): Students will develop the critical thinking skills necessary to analyse and evaluate specific case studies within the geopolitical environment and their impact on global, regional and national security. This includes a 1-week visit to the US. Strategy Exercise (1 week): Students will undertake an exercise where they will apply the strategy formulation knowledge acquired in the Strategy/Policy element. The course is delivered through a series of lectures by senior military officers, civil servants, academics and practitioners who are highly regarded within their field. Central lectures are explored in more depth through Syndicate Room Discussions facilitated by academic and military staff and the Module also expects a high degree of self-study. Defence Policy, Capability Planning and Financial Management, and Risk (4 weeks): Examines the way in which Defence Policy impacts on capability planning and looks at the role of choice within the delivery of a Capability Portfolio including its impact on policy and resource, financial management and the allocation of resource, the treatment of risk, and the scrutiny and approvals process at Defence and TLB level. Alternative Perspectives – UK Industry and US Capability Delivery (2 weeks): Students will undertake a short placement with an industry partner to analyse how programmes, portfolios and risk are managed in the commercial sector. A visit to the US will enable to students to compare US and UK procurement and capability delivery. Capstone Project (2 weeks): A two-week TLB-sponsored, Capability Delivery Capstone Project. The course is delivered through a series of lectures from academia and senior managers from across Government, MOD, business and industry. Central lectures are explored in more depth through Syndicate Room Discussions and workshop activity facilitated by military staff. Industry delegates are fully integrated into the syndicates and the course includes a 2-3 day visit to a Defence Industry which allows industry delegates to host a visit to their own company. Students should view the course as an opportunity to engage in peer learning. Understand (1 week): Explores the techniques that can be employed to understand complex scenarios, the coordination of national and defence intelligence and how PJHQ builds Campaign Planning Teams (CPTs) and Operational Planning Teams (OPTs). Joint Action and Staff Outputs (1 week): Examines the elements of the UK’s Joint Action model, Fires, Manoeuvre, Outreach and Information Activities. Considers how the military is called upon to conduct International Defence Engagement activities in support of national strategic objectives. Examines the theory of defence engagement and explores the emerging doctrine of planning defence engagement and Building Stability Overseas. Reviews countries at risk of instability, early warning requirements, upstream conflict prevention and rapid crisis prevention and response. Operationalising Defence Engagement (2 weeks): Having considered the theory of forward engagement, students focus on one of six regions of the world as an Elective Study. The Ways Module will culminate in a formal presentation in which students will present a proposed defence engagement plan for a country within their region. Campaign Planning (1 week): Students return to a fictitious scenario that requires campaign planning in the context of a UK-led NATO HQ preparing for major combat ops. Campaign Execution (1 week): Students are introduced to Campaign Execution doctrine and practice campaign management techniques in preparation for the Theatre War Game capstone exercise. Capstone Exercise (1 week): The capstone exercise of the module is a theatre war game which brings together the principal themes of strategic analysis, operational art, and campaign design and campaign management. Students will work within a Joint Operations Planning Group (JOPG) with augmentees including POLADs, STABADS, LEGADs, NGOs and media players. An account of the trauma pathway, dealing with casualties and fatalities in the near and longer term, and the subsequent impact on the family. 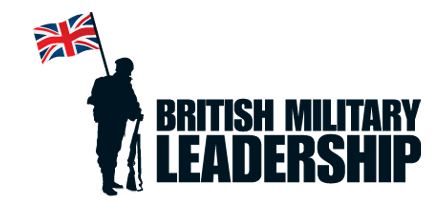 The course is delivered through a series of lectures from civilians, serving military personnel, families of service personnel and injured personnel. Central lectures are explored in more depth through Syndicate Room Discussions facilitated by academic and military staff. A number of combat veterans from a range of operations from the Second World War to Afghanistan participate in central sessions and Syndicate Room Discussions. One 60-credit dissertation core module (Defence Research Paper). Teaching is presented through a variety of formal lectures and Q&A sessions, syndicate room discussions, and group activities. Assessment is carried out formatively through oral presentations, exercises and simulations, role play and case studies/campaign presentations; and summatively through essays, written examination and a dissertation paper. The Royal College of Defence Studies (RCDS) course last 45-weeks (3 terms) and is delivered at Seaford House, Belgravia in London. It is open to high flyers in their chosen profession, at senior Colonel (OF-5) to Brigadier (OF-6) level or their equivalent, who have demonstrated their potential for high responsibilities in their parent organisation or Service. RCDS offers a post-graduate course of international security and strategic studies, focused on strategy and leadership at the grand strategic level. The aim of RCDS is the engendering of strategic understanding, through rigorous analysis of the international security and defence agenda and the levers that provide for security, stability and prosperity; and the inculcation of the key tenets of strategic leadership. Term 3: Contemporary International Issues. During their academic year at RCDS, students may, on passing an entrance exam, study for an MA in International Security and Strategic Studies under a jointly sponsored programme with King’s College London. The existing RCDS lecture, seminar and dissertation programme forms the main basis for accreditation, and this is supplemented by 13 afternoons of extra seminars, spread throughout the RCDS year, led by visiting King’s College London academics. Term 1: The role of international relations theory in understanding the international system; exploring the concept of security in international relations today; WMD proliferation today; international terrorism; competition of resources; failed states; climate change as a security issue; and pandemics as a security issue. Terms 2 and 3: classical strategic thought; grand strategy; constraints on strategy and grand strategy; civil military relations; just war; humanitarian war; deterrence; coercion; the problem of victory; asymmetric strategy; grand strategy of major powers; grand strategy of medium sized powers; and grand strategy of small powers. Does the doctrine of sovereignty still retain utility in an era of globalisation? Is the UN more or less potent today than it was a decade ago? The key problem of the EU is the ‘democratic deficit’ in its institutions of governance – discuss. The MA Programme has been running since 2001 and there is an average uptake of 35%. The Applied Technology Course for Senior Officers (ATCSO) is key employment training for recently appointed or prospective 1* star commanders (OF-6: Commodores, Brigadiers & Air Commodores) from all three Services; directors; and senior civil servants. The frictions caused by technological change on the equipment acquisition process. The Higher Command and Staff Course (HCSC) last 15-weeks and is classroom-base. It prepares selected officers and officials for higher command and staff appointments through studying Operational Art in a Joint and Multinational context, and the nature of High Command. Officers attend HCSC either at OF-6 rank (Commodore, Brigadier or Air Commodore) or OF-5 (Captain RN, Colonel or Group Captain). HCSC was established by the British Army in 1988 to counter the dearth of creative operational-level thinking that became apparent during the latter stages of the Cold War. Its formation acknowledged the need for Officers destined to command at divisional level and above to acquire a deeper understanding of the fundamentals of military theory and practice. Prior to 1988, the only formal course for more senior officers was RCDS, attended by senior Colonel (OF-5) equivalent or 1* (OF-6) officers. The inception of the HSCS recognised the need for a practical command course to supplement the more academic RCDS. Over the years, the structure and content of the course has developed in line with the international and national security environment. With the formation of the UK Joint Services Command and Staff Course (JSCSC) in 1997, the HCSC became a fully joint course. HCSC was initially run at Camberley, and was mainly for Colonels, with a representation of RAF, RN and Overseas students, but moved to form part of JSCSC in 2000. In recent years, it has become increasingly multinational and integrated in both content and student mix. The curriculum evolves by around 40% per annum, ensuring that it remains at the cutting edge of security education. A maximum of 36 students attend HCSC and typically 26 come from the UK military or are Senior Civil Servants within Defence. Four places are allocated to civilians from the wider UK security community and the remaining 6 places are offered to key international military partners. The latter 10 students make a valuable contribution to the course by bringing their own culture and experiences to bear. Indeed, the unwritten product of the HCSC is a trusted peer group likely to assume leading roles in future crises. HCSC is kept relatively short and run at a reasonably high tempo for a small, select group. It provides a collegiate atmosphere that encourages the sharing of views. Students will arrive with different abilities and experiences and should be ready to share these with their peers. Where necessary, the Course will break down into 3 syndicates of 12, each led jointly by a member of the military directing staff and an academic tutor. HSCS students represent the top 2% of their profession and are likely to reach the highest rank in their Service or parent organisation. For example, all of the heads of the UK military are graduates of the HCSC. Students can expect the very best international and national speakers and a very healthy amount of critical debate. All students will need to be cleared to at least NATO SECRET and UK students will need to hold Developed Vetting if they are to access the full range of classified content. Demonstrate and refine the required standards of personal and collegiate behaviour within a network of like-minded security professionals. An early element of the course is academic leadership and management training at the College of Management and Technology (CMT), who are responsible for doctrine, and for providing the Defence Strategic Leadership Programme; this recognises that the Services use different models from, for instance, industry, and that a central ‘translation framework’ is needed to embrace best practice. CMT believe that leadership principles can be taught, but that applying those principles is another matter entirely. Students study a variety of subjects, such as Leadership of Change and Transformation, the Ethics of Leadership and Power Politics, undergo psychometric testing, and take part in sessions on self-awareness and coaching. Exercise Habile Cormorant, a 2-week Theatre War Games exercise, aims to bring together Military-Strategic (Mil-Strat) and Operational Level concepts, doctrine and practice. It centres on concurrent potential conflicts involving two alliances, the Nantes Treaty Organisation (NTO) and the Arcadian Sea Security Council (ASSC). Students role-play at three levels, the NTO Alliance Military Committee (Pol/Mil Strategic), the Alliance Joint Command (Mil-Strat) and the Joint Task Force (Operational). The exercise brings out the realities (and anomalies) of coalition and alliance planning, i.e. you cannot make a plan until you know the forces available, but nations will not declare forces until they have had sight of the plan! There is a media input, which includes one-on-one interviews with key players, and press conferences. It acquaints students with the 6-stage planning process, and includes ‘Red Teaming’ (looking at the same problem from an alternative perspective). Throughout the process, the players can consult ‘mentors’ (recently retired senior commanders). Whilst the emphasis is on ‘freedom to learn’ there is also some formal assessment and reporting. Students will receive individual feedback on their performance in formal debriefing of written and oral exercises and in mid-point and end of course interviews and reports. The leadership phase, which involves personal coaching, is not assessed. British Army (2014a) Join the ETS Reserve. Available from World Wide Web: http://www.army.mod.uk/agc/34521.aspx. [Accessed: 14 May, 2014]. British Army (2014b) Defence and International Affairs. Available from World Wide Web: http://www.army.mod.uk/training_education/24567.aspx. [Accessed: 14 May, 2014]. Defence Committee (House of Commons) (2013) Written Evidence from the Ministry of Defence. Available from World Wide Web: http://www.publications.parliament.uk/pa/cm201314/cmselect/cmdfence/576/576vw03.htm. [Accessed: 14 May, 2014]. Doomsayer (2005) WTF is the Military Analysis A B C Course? Available from World Wide Web: http://www.arrse.co.uk/community/threads/wtf-is-the-military-analysis-a-b-c-course.11975/. [Accessed: 14 May, 2014]. Frost, A. & Black, L. (2013) News: Aide Memoire App Trialled. TAQ: The Magazine for the Territorial Army. Issue 15, April 2012, pp.18. Jones, D. (2012) Command, Staff and Leadership Training in the UK Armed Forces. Available from World Wide Web: http://halldale.com/insidesnt/command-staff-and-leadership-training-uk-armed-forces#.U3Ijc4FdW4d. [Accessed: 14 May, 2014]. NSC (Newman & Spurr Consultancy Ltd) (2014a) Who We Work With. Available from World Wide Web: http://www.nsc.co.uk/who-we-work-with.php. [Accessed: 14 May, 2014]. NSC (Newman & Spurr Consultancy Ltd) (2014b) CONTACT. Available from World Wide Web: http://www.nsc.co.uk/contact.php. [Accessed: 14 May, 2014]. Potter, M. (2013) State-of-the-Art Studies – Press Release. Available from World Wide Web: http://www.defenseprocurementnews.com/2013/10/29/state-of-the-art-studies-press-release/. [Accessed: 14 May, 2014]. SaBRE (Supporting Britain’s Reservists and Employers) (2012) Junior Officers Tactical Awareness Course. Available from World Wide Web: http://www.sabre.mod.uk/Reservists/The-value-of-your-training/Army-Reserve-Course-Guides/Junior-Officers-Tactical-Awareness#.U3OCE4FdW4d. [Accessed: 14 May, 2014].